Source: Hallsville, Ohio Sesquecentennial Celebration Souvenir Program, 1987. We, Ephraim Dresbach, John Bookwalter, and Ambrose Grafton, of the County of Ross in the State of Ohio, do hereby lay off a Town to be called Economy in the County of Ross in Section Nos. 8 and 17 in Township No. 10, Range No. 20. This farm was settled by an early pioneer, Martin Dresbach (jr), and was transferred down through his descendants for many decades. In 1811 the first person buried in the Hallsville cemetery was killed building the original barn. The barn was later burned, caused by lightening. The present barn was built in 1834 from huge timbers hewn out of nearby trees. The old home, log or frame, has long been gone. It has been said the bricks for the present home were made in a kiln on the farm. This home has 4 rooms on the 1st floor and 4 on the second floor and also 4 rooms in the basement. The ceilings are 9-1/2 ft. on the first floor and 11 feet on the second floor. The woodwork was handgrained by George Davison and completed in July of 1877. It is still beautiful on the second story, but has long been painted white downstairs. The home was originally heated by fireplaces; several still exist. They were some marble and some fancy wood. Then for several years it was heated by gas heaters, then a coal furnace. After many years, coal stoves took over and wood was used for cooking. Then a coal furnace was installed again. After a few years a bottled gas furnace was used. Now it is heated by two 100,000 BTU natural gas furnaces, side by side and operated on a single control. 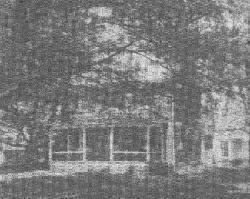 The farm and home had always been in the Dresbach family until it was sold in April 1944 by Susan Dresbach Wright to Hugh and Iva Clark. The house on Whisler Road, finished in 1840, is an example of Greek Revival architecture-- red brick with a white portico over the front door. It was built by a great-grandfather of the present owner, Louise Buchwalter Young. 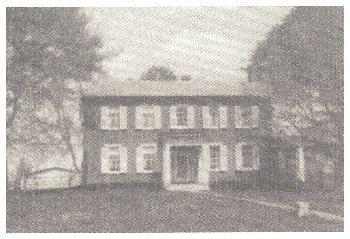 However the farm had been in the Buchwalter family for two generations before the present house was built. An older house had stood on a site just north of the big barn. These two structures were erected in the late 1790s by Isaac Dawson, a Revolutionary War hero who had been granted a section of land in recognition of his service to the country. Both the house and the barn were made of logs held together with wooden pegs instead of nails. These logs are still visible in the barn (which was faced with white clapboard at a later date.) The Dawson house, although built of logs, was of ample size and unusual plan. It was a two-story structure with upper and lower porches. The second floor was one large room which was used for religious and social meetings of the community. Abraham Buchwalter migrated from Pennsylvania and bought the farm from Dawson about 1816. He lived in the old log house and brought up his family there. One of his sons, John, built a house in the village of Hallsville. But his son, Levi, returned to the farm and built himself a handsome new house there. This house was constructed entirely of materials found or grown on the place. The floors were made of wide oak planks cut from trees harvested on the farm; the woodwork and beams were made of solid black walnut. The new house was much larger than the old one and it had a modern convenience-- a clothes closet in every bedroom. Just a short time earlier the settlers had discovered that fine bricks could be made from the local clay instead of importing bricks from Pennsylvania, as had been done earlier. The bricks from Levi's house were made of clay dug from the hillside and baked in a homemade kiln. There is a favorite story passed down in the family about the making of these bricks. When Levi's youngest son was just three or four years old, his older brothers tied him on the back of one of the oxen to guide it on the tread-mill where the clay was prepared and they promised that as a reward for this boring work he would be given half share in a yellow tabby cat, the pet of these canny brothers. When the brothers were old men, one of their never-ending arguments was whether this promise also entitled the youngest to half-share in the kittens that arrived a few weeks later. The bricks alone took seven years in the making, but finally the house was finished in 1840. The old log house was torn down, but not before the beautiful cherry woodwork had been removed and installed in the downstairs bedroom of the new house. Abraham did not live long enough to see his grandson's house complete, but his wife Barbara lived to be 98years old. She occupied the downstairs room, while Levi, his wife Margaret, and the five children had the three upstairs bedrooms. Over the years a number of additions were made to the house. The last one, built in 1916, was a brick wing. At this point the house had a total of sixteen rooms. Then late in 1981, about ten days before Christmas, the house caught fire and was very severely damaged. All the additions were entirely demolished, but the original six rooms which were each surrounded by foot-thick brick walls were less seriously burned. The Youngs decided to restore these original rooms; so the house as it now stands, is almost exactly the same as the house that was completed in 1840. This property is unusual in that it has been owned and used continuously by one family for six generations (or eight generations counting Grandmother Barbara). It is now listed in teh National Registry of Historic Sites. Present owner Leota Belle Clark (in 1987). First owned by town founder, Ephraim Dresbach. Three houses have stood on this lot, two of which were moved and are now occupied on each end of town. Lot #35 of the Village of Economy. 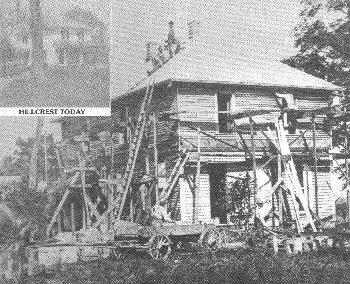 Owners over the years were George Pontious, Joseph and Deliah Hough, Clarence and Ethel Patrick, Curtis and Mae Jones, Hugh and Iva Clark, Hugh Clark, Jr., and Leota Belle Clark. A cemetery is directly behind the house. The grave stones were long ago removed, but the graves of those buried are still there. The cemetery measures thirty-three feet by forty-nine and a half feet on the section line. Mr. Hough was a thresher and kept a Garr-Scott steam engine in the barn at the rear of the property. 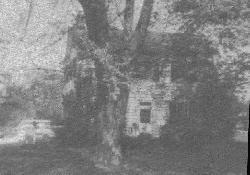 In 1837 the Lots 24,25,26,26, where the residence now stands, were owned by John Bookwalter. Believe the house to have been built in 1845 or '46, since the first taxes were paid in 1847 for a structure on premises. 1873 - From John Bookwalter estate to Calista Halsey to Albin Reichelderfer. $2100. 1875 - From Albin Reichelderfer to Ephraim Dresbach. 1878 - From Ephraim Dresbach to Harvey Dresbach. 1880 - From Harvey Dresbach to Harrison Bookwalter, $3000. 1900 - Tax duplicate of house value - $420. 1923 - Jesse Delong from Frank Bookwalter by Guardian, Sheriff's deed in partition ($1925). The ground that Hillcrest sits on was first purchased by John Strawser in the year 1808, and was owned for a short time and was sold to Ambrose Grafton in the same year, 1808. In 1851, Samuel and William Grafton and their heirs lost it and it had to be sold at a sheriff's sale in 1853 to Henry Bookwalter. We believe about that time the now Hillcrest was built as a one-story dwelling. Henry Bookwalter then sold to David Jones in 1865, David Jones sold to George Tyler in 1868 and George Tyler sold back to David Jones in 1872. David Jones then sold to Katherine Jacobs in 1875, and at that time there was a bar or pub here called the "Red Onion." In 1879 the property was purchased by the Dresbach familyand was owned by them for over a hundred years. During that time they had a cherry orchard on the property, nice grape vineyards and a large apple orchard across the road from the barn. The original barn was struck by lightening in 1912, and the now standing barn was built the same year. In 1914 the second story was added and some of the men that helped were Ed Richards, Sam Karshner and Bill Jones. The Harland Dresbachfamily lived here while the construction was going on. Later shingles were added. Guy and Bonnie Norman purchased Hillcrest in 1983. The name of the home was given to it by Miss Jessie Dresbach, one of and the last survivor of a family of sixteen children who claimed it as home. Their parents were Rose and Gedekiah Dresbach. The home and land was formerly a part of theLevi Buchwalter holdings. Levi was an early settler in this area and his acreage was vast. The large house has a huge yard. A horseshoe drive circles from the road to the front of the house and back to the road. The yard is covered very thoroughly with maple trees. In the summer when the trees are full of foliage it is difficult to see the house. In the fall, leaves cover the ground up to one's ankles. The road leading from the Post Office in the center of Hallsville, north to this house, is lined on both sides with maple trees and was named "Maple Avenue" (unofficially) by Jessie Dresbach. Approximately in 1860 the Hickel family built this home and in 193? Walter and Barbara (Bookwalter) Petzel bought the farm and home from Mrs. Earl (Ilda Kellenberger) Dresbach and on January 1, 1966 the Petzel family moved to Colerain Township on Whisler Rd. to make their home. 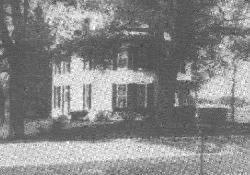 Mrs. Howard (Gladys) Bookwalter's home was built by the late Howard Bookwalter's great-grandfather, Abraham Buchwalter (Bookwalter) in 1824. 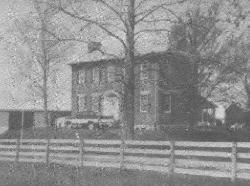 In June of 1824 the annual Southeast Ohio Conference of the United Brethren Church was held in this home. Earl and Alice (Yaple) Fox and their one year old son Dale lived in this home at the time of the Centennial Celebration of the founding of the village of Hallsville, Ohio. 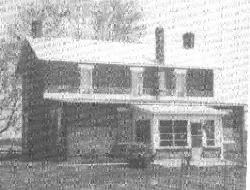 In 1940 Mrs. Cameron (Louise Buchwalter) Forster, youngest daughter of Judge Morris L. Buchwalter, a nephew of Abraham, came to Colerain Township to make her home next door to her brother, Morris Buchwalter of Applethorpe Farm. She named her farm "Twinbrook Farm", the name it bears today. Howard Bookwalter and his wife Gladys (Roe) and daughter Harriet Ann moved into his home in the fall of 1955. Samuel Dresbach bought 811 acres from Jobs Knob to and including the Martin Dresbach homeplace. Josiah Dresbach bought this 145 acre farm in 1890 from his father, Samuel, and his son, Walter A. Dresbach, bought it in 1919. Dana and Celia (Dresbach) Ziegler bought it from Bookwalter in 1953.